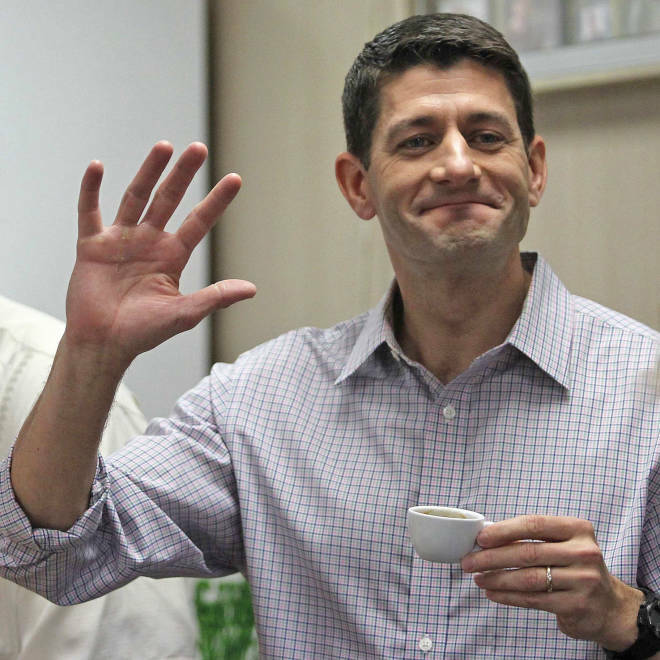 Republican vice presidential candidate Paul Ryan waves to supporters while holding a cup of coffee during a campaign stop at a Cuban restaurant and coffee shop in Miami on Saturday. BELOIT, Wis. -- Paul Ryan has been campaigning as Mitt Romney’s running mate for six weeks but it wasn't until this week that the Republican vice presidential nominee finally pulled out a tool from his own Wisconsin playbook: a PowerPoint presentation. “I'm kind of a PowerPoint guy so I hope you'll bear with me,” the Wisconsin congressman and budget guru joked to a crowd full of supporters Saturday afternoon in Orlando, Fla. Speaking on the campus of the University of Central Florida, the wonky Ryan used four different slides to help demonstrate the problems with the nation’s debt and how spending has changed under President Barack Obama. Michael Steel, a spokesman for the Romney campaign, said the use of the presentation – which was displayed on two large television monitors inside a gymnasium – was “simply another tool to highlight President Obama's failed leadership." But it’s also a staple of Ryan's campaigning for his seven terms in the United States Congress. After debuting the PowerPoint slides in Florida, Ryan went on to hold a nearly 30-minute question and answer town hall session with the couple thousand-person crowd. This “new” prop comes just following reports casting Ryan as “mini-Mitt” -- that is, the Romney campaign had forced the congressman to follow the lead of the nominee, rather than letting him be himself. Plus, early Friday morning, Wisconsin Gov. Scott Walker publicly chided the Romney campaign for not “effectively” utilizing the GOP vice presidential nominee. But, Ryan told reporters, he is happy with his role. The quick event, though, marked Ryan’s first retail drop-by since Aug. 25, when he stopped by the Puritan Backroom restaurant in Manchester, N.H., despite holding more than 50 events in the last month and a half. In the lead-up to his VP selection, Ryan would answer questions from the press practically whenever reporters would have questions. In the month and half since being tapped on Aug. 11 to fill this new position, the congressman has yet to do a formal press conference. Friday, standing inside the fruit stand, was the first time Ryan has answered questions from the press on the ground (he has held two quick gaggles on board his press plane flying between states). When the House Budget Committee chairman first joined Romney’s ticket in August, he was forced to align his views with his running mate noting “no two people agree on every single issue” and Romney is the top of the ticket. But as the weeks go on, it appears Ryan is settling into his role as Romney’s number one surrogate on the campaign trail. Perhaps this weekend is the start of Ryan being allowed to insert more of himself into the ticket with just 44 days left before Election Day.